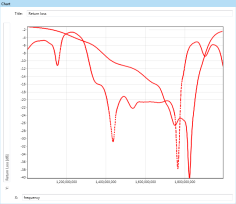 This application note will take you through the process of adding a new antenna template to your Antenna Magus database. The antenna used in this note is from a paper that is available from IEEExplore. The paper could not be distributed as part of the application note due to copyright restrictions, but is recommended to obtain the paper, as this example is heavily reliant on it. Jellett, S.T. Bialkowski, M.E. "A circularly polarised MSAT antenna element with increased operational bandwidth", Antennas and Propagation Society International Symposium, 1994. AP-S. Vol 2. PP 1044-1047. This application note also requires the use of existing template and model files. A zip file containing these files is available for download here. This file contains two antenna templates. One is complete and the other is partial. This is a CST Studio Suite model of the antenna. It has been parameterized, but not validated in any way. This is a FEKO model of the antenna. It has been parameterized, but not validated in any way. This section will guide you in making a template for Antenna Magus to use. Antenna templates are the data format in which antenna information is captured in Antenna Magus. To create a new template click 'New Template' on the ribbon on the home tab. This will add a blank card to the Find mode workspace and automatically change Antenna Magus into template editing mode. For this application note however, it is recommended to work from the partial template as supplied. To import the partial template, select 'Import Templates' from the drop down menu in the top left corner. This will open a file dialog where the templates file 'AM-AN-001.am-templates' file should be selected. There are two templates in the file - one partial and one complete. Select only the partial template and press 'Import'. Once imported, the template will be visible in find mode. Select the template and press 'Edit template' to change into template editing mode. The Antenna Magus logo has been used as a placeholder in the partial template. To change it, hover over the existing thumbnail and select replace. Choose the 'thumbnail.png' file. 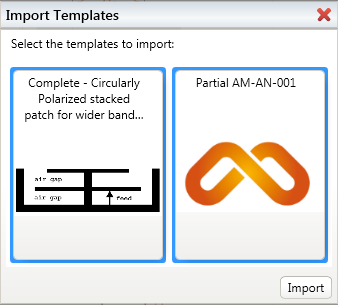 The name of the antenna template can be changed at the top of the workspace - this template is currently named 'Partial AM-AN-001'. 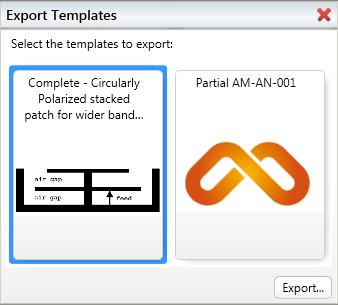 Change this name to 'Circularly Polarized stacked patch for wider band array element'. Search terms are used in Antenna Magus to search through the database. Two types of search terms (called 'keywords' in Antenna Magus) can be added to templates. The first type has already been defined in Antenna Magus and the second type can be defined by the user. According to the paper, this antenna has a bandwidth of 15%. 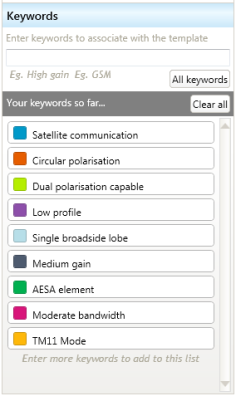 In Antenna Magus, the search term 'Moderate bandwidth' has been used to describe all antennas with an operational bandwidth between 10% and 70%. 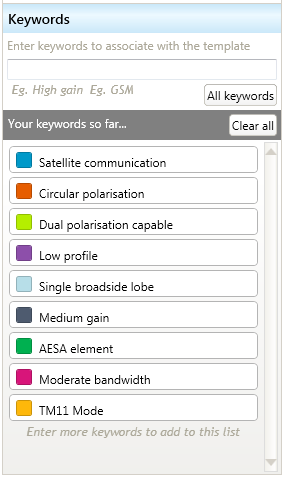 To add the 'Moderate bandwidth' keyword to this template, click the 'All keywords' button and navigate to it. Keywords can also be searched by using the textbox provided. The paper states that this antenna can be used in TM11 mode. Using TM11 as a keyword is therefore desirable, but has not been previously defined by Antenna Magus. To add this keyword, simply type it into the text box and press enter. Any keywords not found in the Antenna Magus dictionary are assumed to be custom keywords. The 'Quick Summary'table can be edited in place. A quick scan of the paper reveals that the antenna has properties as shown. Note that the fields are free form, so any known information can be entered. The following text can be added to the 'Background' of this antenna. It is recommended to copy and paste this text. Note that it is taken verbatim from the paper. "With recent developments in mobile satellite (MSAT) communications, there has been a lot of activity in the area of antennas which would be suitable for this particular application. There are many requirements for the MSAT antennas, and they include low profile, circular polarization, sufficiently high gain and operational bandwidth of about 8%. Microstrip patch antennas have been found to be one type that is suitable for MSAT applications provided that their typical bandwidth of less than 4% is increased. One solution to improve the bandwidth is to increase the patch antenna height above the conducting ground plane. This however leads to the use of thick substrates which inevitably results in increased manufacturing cost of the antenna system. Another problem associated with antennas of increased height is that there is often a reduction in the isolation between the individual array elements (when no shielding is used). Such a lack of isolation can result in a difficulty to predict the operation of the whole antenna system." Go to the 'Parameters, Sketches & Guidelines' tab of the template. On the Palette there are two sections - 'Objectives' and 'Parameters'. The scaling frequency is used by Antenna Magus to scale prototypes to any desired frequency. All other parameters that are length-type will be scaled by the ratio between this frequency and the design frequency of the prototype. In this case, the antenna was designed around 1.6GHz. Edit the scaling frequency from 300MHz to 1.6GHz. Change the description 'scaling frequency' to 'Centre frequency' so that it is more descriptive for the user. Several parameters have already been added to the partial template, but two are still missing - these are the diameter of the top patch and the relative permittivity of the feed disc. 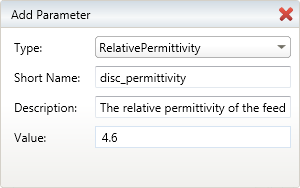 To add these parameters, press the 'Add Parameter' button. Take care to set the parameter type correctly - Length type parameters are scaled on design of prototypes. The diameter of the top patch is 81mm and the relative permittivity of the disc is not given in the paper, so it is set at 4.6. Sketches can be added in much the same way as the thumbnail was changed. Add the 'sketch.png' file as a sketch and give it a suitable caption. This particular example paper only has one sketch, but several can be added. It is most effective if sketches displaying parameter names are used. Some design guidelines found in the paper have been added under this section already. The following guideline can be added too: "The coupling value depends on the size and height of the two patches. When there is insufficient isolation between the two feeds of a circularly polarized antenna, the connection of a 3dB coupler results in a very poor return loss at the input to the coupler. To overcome this problem, four feeds can be used to cancel out the higher order modes." Switch to the 'Models' tab of the template. Two parametric models for this antenna have been prepared and distributed with this application note - one is a FEKO model and the other a CST Studio Suite model. This procedure is identical for both models and is described here generically. Press 'Add Model' and browse to the model that must be imported. The workspace will display some properties of the model, the associated model information and the mapping of Model parameters to Template parameters. The Model parameters are imported from the file. Add the following information for the model: "This model is created for demonstration purposes and has not been validated to work correctly at all. The reference paper does not provide all the parameter values needed to replicate the performance of this antenna. The geometry will update and the solver should run, but at least a mesh convergence study must be done before use." In the 'Details' section, the Status must be changed from 'Draft' to 'Complete'. This status determines if a model can be exported from Antenna Magus. This feature prevents the accidental export of an incomplete and erroneous antenna model from Antenna Magus. The Frequency and length units must be correctly set! If this is not done, the values will be exported incorrectly. The example FEKO model is made in (Hz, m) and the CST Studio Suite model is made in (GHz, mm). Meaningful captions can be added. This is useful when there are many helper models for the antenna. Update the associations table to associate the correct template parameter with the correct model parameter. Any model parameters that are not associated with a template parameter will not be updated when a prototype is designed. 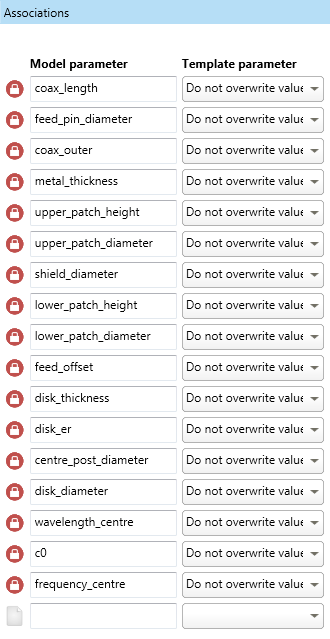 The red lock icon indicates that these parameter names are in the model, but have not been linked to any template parameters and will not be editable in Antenna Magus during design or export. 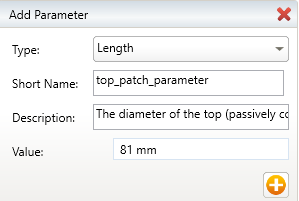 In order to make specific model parameters accessible in Antenna Magus, use the drop-down selection to choose a parameter that has been defined in the template. New parameters can be added to the model if needed. Performance charts are displayed when looking at the 'Performance Estimate' tab of a prototype. The reference paper gives 4 result graphs - Return loss without the branch coupler, Port isolation, Return loss with the branch coupler and a radiation pattern. The return loss with and without the branch coupler will be put onto the same graph to facilitate comparison. Add a new chart to the template by clicking 'Add Chart' and choosing Cartesian. 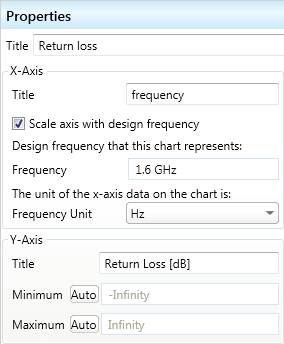 Make the title of the chart 'Return loss', the X-axis label 'frequency' and the Y-axis label 'Return loss [dB]'. Since the X-axis is frequency, the values should change when a prototype is synthesized using the scaling feature. To enable this, select the 'Scale axis with design frequency' checkbox. These results are for the antenna scaled to work at 1.6GHz, and should be filled in in the appropriate box. The data that will be put in will be in Hz, so the frequency unit box should be left unchanged. The data for the first trace is in the file 'S11-no_coupler.tsv' file. Click the 'Add Traces' button and import the data. Change the name of this trace to 'No branch coupler'. The data for the second graph still needs to be digitised. 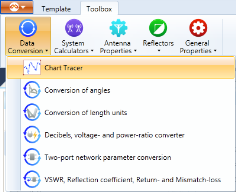 To do this, change to the 'Toolbox' tab in Antenna Magus and select the 'Chart Tracer' from the 'Data Conversion' drop down menu. Using the button next to 'Background image' open the file 'S22-with_coupler.png'. Move the two red anchor points to known value locations on the image. Enter the values at these known coordinates (be sure to enter the x-axis values in Hz). Change the interpolation scheme to 'Spline'. Now select points along the trace, until you have adequate resolution to reproduce the trace. On the 'Export' button, select the 'To Clipboard' option. Switch back to the template view, and select add the trace from the clipboard. Name the trace "With branch coupler". Now add new charts and create the traces for them using the chart tracing tool as described for the previous graph for the port isolation and the pattern. The port isolation graph is in the file 'port_isolation.png' and the pattern is in the file 'pattern.png'. Note that when adding the pattern, the x-axis should not scale with frequency. The setup of the template is now complete and ready for use. Close the template by clicking 'Close template' on the ribbon. Custom Antenna Magus templates can be exported and saved to an external location for backup and distribution purposes. To export a template click on the Antenna Magus drop down in the top left corner of the window and select 'Export Templates'. The 'Export Templates' dialog will be displayed showing all the custom templates in the 'Antenna Database'. Select one or more templates by holding down the 'ctrl' key and clicking on the icons. Click on 'Export' and save the export file as 'Export Import Example.am-templates' to a convenient location. The custom templates are now exported and can be distributed or backed up. The exported templates are imported in much the same manner as they were exported. Click on the Antenna Magus drop down in the top left corner and select 'Import Templates'. Open the 'Export Import Example.am-templates' file. 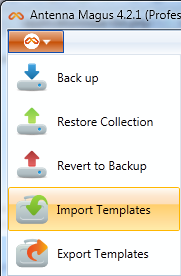 The 'Import dialog' is shown with the templates available in the file. Select one or more of the templates by holding down the 'ctrl' key and clicking on the icons. Click 'Import' to import the templates into Antenna Magus where they are now visible in the 'Antenna Database. The antenna template that has been added can now be used in the usual way. At this point, add the antenna to the collection and design it. 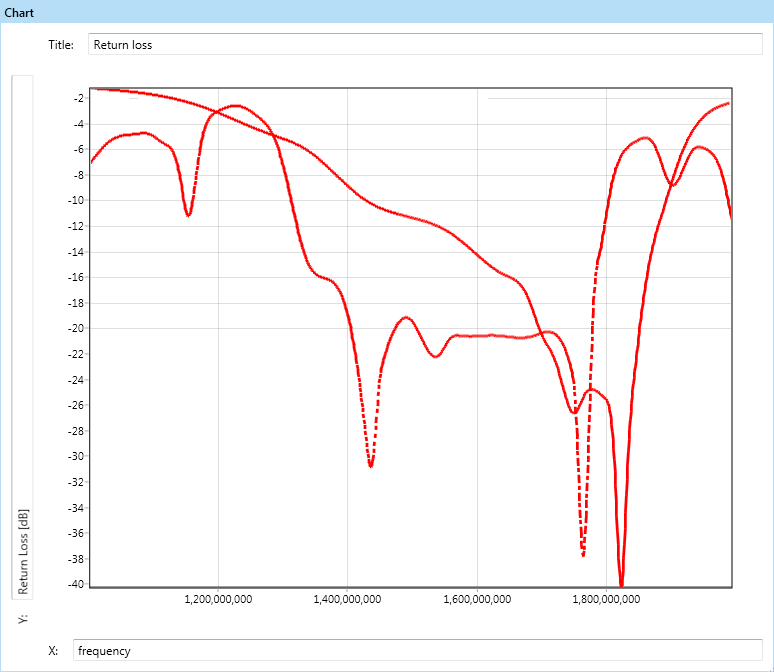 Enter the scaling frequency of 1.6GHZ. 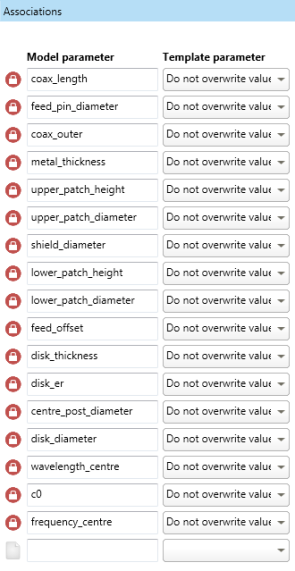 All parameter values etc. should be as provided in the paper. Now try a scaling frequency of 800 MHz. All the length type parameters will double in length. Export the models and check that the parameter values are set correctly. A complete template for this antenna is also supplied as an example.